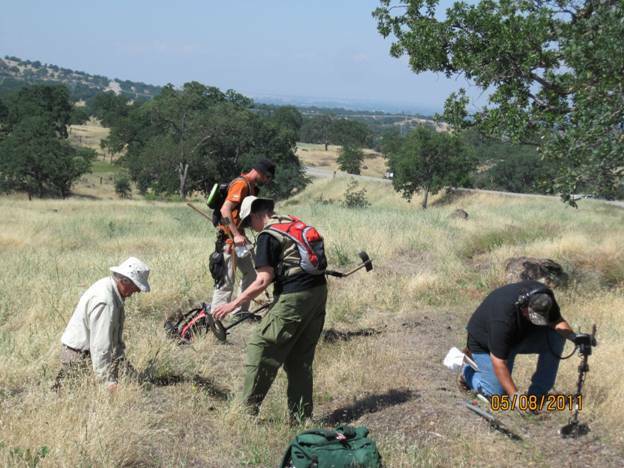 The 2011 Passport in Time project, sponsored by the Redding Field Office of the Bureau of Land Management, consisted of a week of archaeologically-oriented metal-detecting, documentation and placement of interpretive signs for a handful of historic features. The project was focused on re-locating the dismantled 1870s wooden Blue Ridge Flume that was used to transport lumber products from mountain mills to valley centers. A separate day was also directed at establishing better definition of an historic wagon road (Inks-Jelly Road) used for ranching and transportation of the better cuts of timber. Finally, investigations were made along several short segments of the early Tehama Wagon Road, and a rock wall, likely used for sheep control, possibly built by Chinese laborers. The investigations were done on approximately a half mile of alignments, and involved the use of metal detectors for discovering flume remnants, road activities, and losses/discards. Several cabin sites, possibly flume-tender locations, were also investigated. The work resulted in a better definition of the flume and road alignments and construction, and the recovery of archaeological specimens. Discovered features and artifacts will aid in feature interpretations for both the scientific and historical community and the general public. Location markers were placed at a number of points.